Thornton Road Domes. 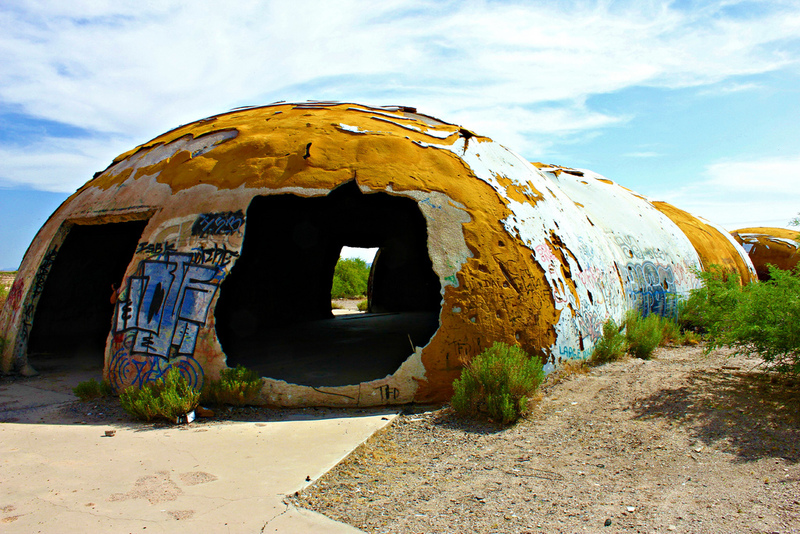 (Casa Grande) Abandoned now for many years, these domes were originally built for an electronics manufacturing facility. Many eerie things have been reported to occur. The domes are hard to explain and attract, artists, bums, possibly aliens. 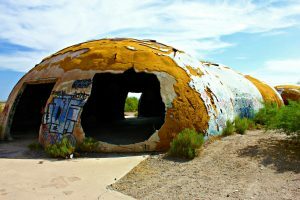 The Domes have been added to Arizona’s list of haunted places because of the sitings of shadowy figure seen creeping around. Very odd sounds and vibrations have been reported to be heard as well. So we suggest checking it out for yourself and seeing what you see and hear. Aircraft Boneyard. (Tucson) Davis-Monthan Air Force Base is the graveyard to abandoned airplanes. Find airplane carcasses out in the dry, open space. Many of these “bones” are from the Vietnam Era and later. When these large aircrafts are finally put to rest, it can be emotional for those that flew them and remember the “going ons” of that time. Biosphere 2. (Oracle, Arizona) A 3.15 acre sealed glass house, funded by John P. Allen, we made to recreate the environenment and conditions of earth. With a few failed experiments of people living in the sphere, the$150 million project has been scrutinized. Recently bought (2007), by University of Arizona, it now used for educational purposes. You can tour the Biosphere and see the species that are thriving in it and experiments taking place. Casey Moores (Tempe). An old Local Favorite built in 1910. A favorite among many, it has been a restaurant since the 70’s. Many spirits have been seen in this old haunted house, including a young light eyed woman who is said to have been murdered by a man that would not take “no” for an answer. She has been spotted by many. You can even visit the upstairs “haunted area”area. Aside from the fact that paranormal activity occurs, it’s a great pub style place to have a cold beer and some oysters. It’s not that odd, but we consider it a landmark that should be visited after one of the other “odd” suggestions above.